I recently installed Emby Sever 4.0 B on my Ubuntu Server and it seems to be working great, at least what I have tried so far. That being said, icons under "On Now" on homepage display wide rather than narrow/tall as they do in my browser. Because of that they are a bit distorted. I am assuming this is a roku thing ( I have a Roku Stick +). When you are in the Guide, the upcoming episodes are the same way. interestingly, Upcoming movies is OK, but upcoming sports and upcoming Kid's shows are likewise not right. Latest recordings is wide rather than tall, but appears to look correct, not distorted. 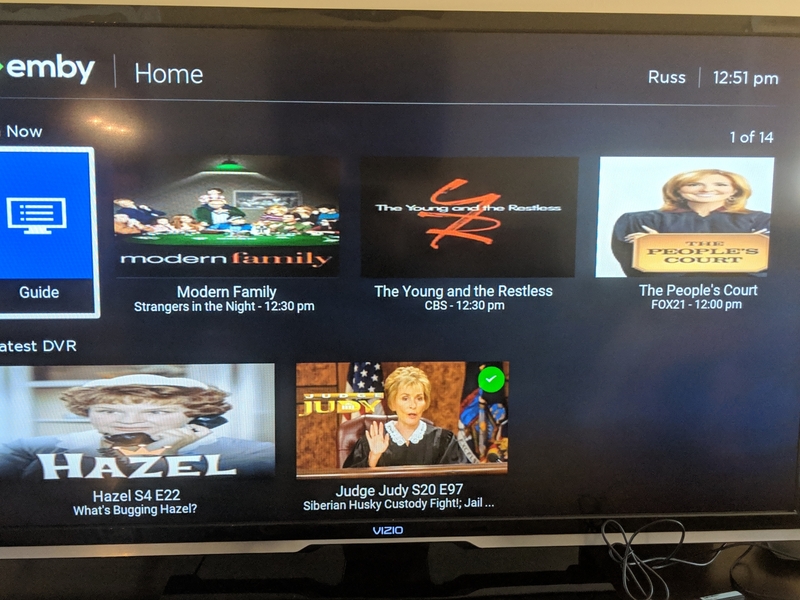 If it something I can correct or have messed up, let me know but I am assuming it something the Roku App folks will need to address at some point. It is definitely usable so not a crisis. Hi. Did you also change your guide provider to the new Emby included one? Yes I did. If relevant, looks fine on both webrowser and LG TV app. Can you show a screenshot to demonstrate? Not sure how to take a screen shot from my TV so I snapped a few with my phone. Here is from my Home Screen/ on Now, can send more if it will help. Not sure if it is related, but I get a thin green line down right of screen when watching Live TV too. Not on movies or menus. Not visible when on my web browser. Appears to be on all channels. Thanks. This should be fixed in the next app beta. Glad to help. You guys are terrific!